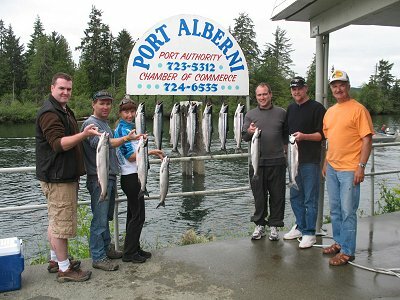 29th June, 2010: FISHING REPORT: Port Alberni Inlet, Barkley Sound, Ucluelet (West Coast), Somas-Stamp River System. The salmon fishing in the Port Alberni Inlet and the area just outside of the Ucluelet Harbor has been phenomenal to say the least. Barkley Sound has had its good days but one might say has been “on and off” in terms of the salmon fishing. 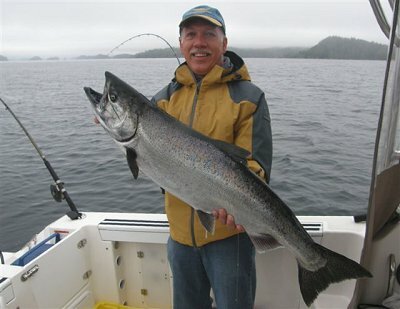 The June weather pattern has benefited some great salmon fishing as those gloomy days of May are only a distant thought. Water conditions in the Alberni Inlet have been perfect as they always are and the water around the Ucluelet Harbor and offshore has been almost perfect for the last number of days. With July approaching the summer salmon season will really begin to “heat up”. Sockeye escapement into the Somass River and through the counters into Sproat Lake and Great Central Lake has been very good. The most recent report dated June 24th has calculated 114,000 sockeye have gone through the counters. Approximately 78,000 Sockeye have moved into Sproat Lake and 36,000 into Great Central Lake. There was some concern about the Great Central escapement because of the continued fast and high water but on one given day 12,000 Sockeye moved into the Central Lake system. The Somass River Sockeye return in 2010 is expected to be 600 to 700,000 pieces. There may be an upgrade on the run size on July 1st. Latest statistics show that there are 55,000 Sockeye swimming in the inner waters and 65,000 Sockeye swimming in the outside Inlet waters. The sport Sockeye fishery in the Port Alberni Inlet has been spectacular to say the least for almost two and a half weeks. People have thoroughly enjoyed their time on the water as the action on most days has been fast and hectic. The DFO has continued to keep the sport limit at two Sockeye per day but many are expecting that number to be raised to four by Saturday or Sunday June 26th-27th. The early season has seen many of the Sockeye salmon swimming in the top 20 to 45 feet of water. As the days become warmer and the water in the Somass River and the Inlet water warms up the Sockeye will gradually move down into deeper water. The Sockeye fishing has been phenomenal from the Nahmint-Franklin area right up to Cous Creek and Lone Tree. Most of the salmon have been weighing four to six pounds with the odd early fish coming in at seven or eight pounds. The key to landing Sockeye is finding the schools of salmon and also running plenty of color behind the boat. Most individuals will run at least six flashers anywhere from 8 to 12 feet behind the boat. Two of these flashers are termed “dummy flashers” and the other four have a short 22 to 28 inch leader with a small pink or red mp hootchie behind a red or green hotspot flasher. If you have not fished Sockeye do not be afraid to ask others for information. Also look where the boats are gathered on the water. The Sockeye fishery can often continue into the first week of August. We are looking forward to a very long and fun season of Sockeye fishing. The Sockeye sport fishery is a great family activity as children and others of all ages have on most occasions a great experience on the water. Barkley Sound has had some great days of fishing. However there have also been those slow days which can be expected up to this time of year. Surf line areas and the waters as far back as Pill Point have at times been superb. It seems that most often guides and sport fishermen come home with great fishing stories as long as the area they were fishing had bait fish. Swale Rock, Meares, and the Austin Island area as well as Edward King, Folger Island and Ship Island have been consistent areas to fish through the spring months. Chinook salmon migrating to southern watersheds swim into the Sound area to feed on the rich sources of bait fish that Barkley Sound has to offer. Swale Rock and Meares and Austin have been fairly decent. Over the last ten days Swale rock has produced in the early morning and also during the night bite and Meares and Austin out to Pinnacle Rock has had good activity on tide changes and early mornings and evenings. Guests over the last week were delighted to land some Chinook on the surf line. 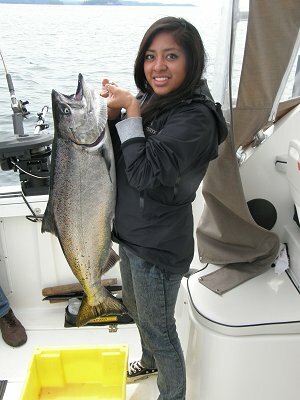 The largest guided Barkley Sound Chinook came in at 22 pounds followed by a 20 pound fish and several in the high teens. The largest Chinook landed was picked up at Austin. The fish at Meares and Austin Island have been in 80 to 115 feet of water and are actively feeding on pilchards. Chinook salmon around Swale rock have been found in 75 to 90 feet of water as have the Chinook at Edward King and Ship Island. Army Truck glow hootchies and needlefish plus the army truck Rhys Davis Teaser Head have been working very well. White hootchies and various coyote spoons especially the cop car and the green-glow in the four inch size have also been very good for most fishermen. With the high volume of migratory fish swimming to southern watersheds we are expecting a great month of July for Chinook and Coho. The Coho to date have not yet materialized in the Sound area. When they do arrive they will be in good numbers. Ucluelet salmon fishing has been rather spectacular in many popular areas as is the case most years. Great Bear, Mara Rock and the Lighthouse Bank have all been good for Chinook. The Lighthouse Bank salmon fishing has been very good for the last ten days with the fish laying in 90 to 130 feet of water. Coyote spoons at the four inch size with blue-nickel, green-nickel, and the green-glow all working well. Great Bear has also been good. However on Saturday the 26th of June a pod of Killer Whales rolled in and the fish scattered quickly slowing the fishing dramatically. South Bank at the adipose and the corner has been great with again the salmon being in fairly deep water from 80 to 125 feet. The Big Bank has had great salmon and halibut fishing. 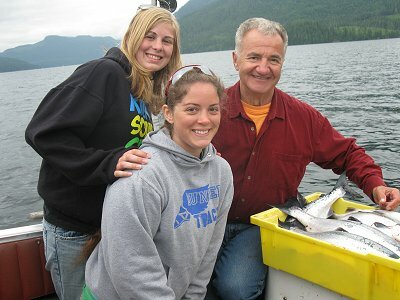 Most of our salmon-halibut combo trips are going out to that area. Those going out on guided trips and sport fishermen with their own boats are encouraged to take part in the Ucluelet Salmon Ladder Derby. The Derby is running each month during the summer and wraps up on the weekend of September 11th and 12th. The two major sponsors are Ucluelet Tourism and the Thorton Creek Hatchery. The winning fish to date for the month of June is 30 pounds 4 ounces. The first place fish for June will receive $7,000 with second place at $2,000 third place $1,000 and fourth place $500. The same prizes will be awarded in July and August. The wrap up derby in September will include those people on the ladder in the top 50. At the moment the top fish will win $20,000. This is the current figure. The weigh-in for each day with those with tickets is the Ucluelet Boat Basin. Ticket prices for this fishing, derby per day per person is $10 with an annual ticket priced at $50.00. 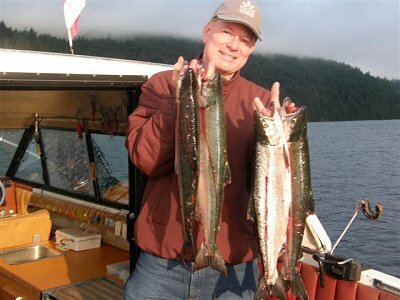 Ucluelet offshore and inshore fishing will be rather spectacular this summer as will the sockeye fishing and later in the summer Chinook and Coho in the Alberni Inlet. Barkley Sound fishing is expected to really heat up in July.